6 Board Games for the Whole Family — Even Preschoolers! Full Disclosure: I love board games. I loved them when I was a kid and I still love them as an adult. I feel like I’ve spent most of my life looking for people who will play board games with me and am thrilled that my kids (ages 8 and 4) are both old enough to play games with me now. That being said, it’s pretty challenging to find games that we can all enjoy playing together. Some are tough because my little guy needs to be able to read to play them. Some make my children so competitive that they nearly come to blows. And some are just sheer torture for adults to play. Candyland sends my husband — and me! — running for the hills. Last December I was on the look-out for some good family games to give my kids and when I solicited suggestions from friends on Facebook I was thrilled to get more than 40 responses! Woo hoo! I haven’t played all of them so I don’t feel up for recommending them here, but we did get a couple for the boys. We bought a lot of the games I’ve listed below new, but I’d like to take a moment to recommend that you keep an eye out for board games at garage sales this summer. They are usually pretty cheap — I usually pay well under $5 for them — and they are often in great shape. As long as they have all their pieces, I almost always pick up any I see since most board games cost $15-30 new. Oh, how I love this game ! This was the #1 recommended preschool game when I asked my friends so we bought it for Augie for Christmas and I don’t regret the purchase at all. It involves searching a detailed drawing, counting and cooperative play. Players compete together against the game — not against each other. It’s not super-engaging for adults, but I do enjoy the fun of finding hidden objects and the kids adore it. And best of all, they always — and I do mean always — work together when they’re playing instead of engaging in their usual bicker-fest. Jenga is one of those classic games that everyone should have on hand. It’s challenging for everyone (but not too challenging), an unlimited number of people can play and it doesn’t require any reading so a preschooler can hold his own. I also like that it teaches physics and fosters those fine motor skills. Most of Lego games we’ve played are pretty good, but Creationary is our favorite by far. Everyone in our family loves to play it. 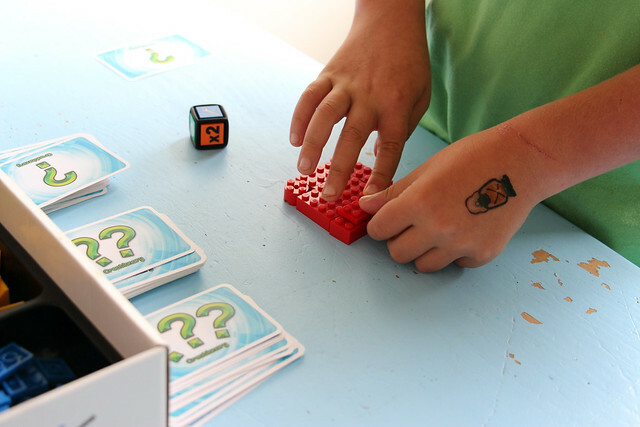 The premise is pretty simple — players take turn drawing cards and attempt to build the pictured items with Legos while the other players try to guess what they are making. My 4-year-old makes simple shapes, while his Grandpa wows everyone by building excellent sculptures using an elegant economy of bricks. After awhile we almost always tire of what little competition is involved in this game and we all just sit around drawing cards and building simultaneously, but it’s all good. We bought our Battleship game at a garage sale for $2 and what a bargain it was! This game is a little too complicated for my preschooler to play on his own, but he loves playing it as a team member with me or his dad. The grown-ups keep track of recording the hits and misses with the pegs, and he determines where the boats should go and points to the squares on the grid where we shoot our missiles. My 8-year-old loves the graphing and the competition and he’s usually a pretty good sport when he falls behind. Go Fish is a perfect introductory card game for little kids and best of all it’s portable and usually very inexpensive. We got our version of this game as the treat included with a kids meal from a grocery store deli! Both kids are learning the basics of card games by playing this — taking turns, how to hold a hand of cards, how to organize them and keep them hidden from view. I enjoy playing this solid, basic game and I also like that we can play several rounds in a spare half hour. Of all the games on this list, this one is the least appropriate for younger kids, but I’m including it anyway because my preschooler and 4th grader both beg to play it. We gave my older son this Monopoly Millionaire game for Christmas this year and our family has played it quite a bit since then. It has all of the standard elements of the traditional Monopoly game, but it’s been significantly streamlined and takes a fraction of the time to play a game. All of the usual learning elements are still there though including math and negotiation skills and good sportsmanship. Again we adults have the preschooler play on our “team” and ask him to make some of the decisions which has the added benefit of leveling the playing field between the grown-ups and the older kid. What games does your family like to play together? Please comment with any favorites below! More disclosure: This post contains affiliate links. We actually own all the games in that picture up there though and I’m writing this post because we play them and enjoy them!